After receiving a phone call, the aging Kim Soon-yi travels from the US back to South Korea to deal with the sale of the countryside home where she grew up. She remembers back to 47 years earlier, where she, her mother and younger sister arrived there following the death of her father. She discovered a feral boy hiding out and they slowly befriended him, giving him food and clean clothing. She began to domesticate him after employing techniques from a book on dog training and named him Chool-soo. A slow affection and tender love began to grow between the two of them. This was threatened by their landlord Ji-tae, who was determined to have Chool-soo regarded as a wild animal. When pushed however, Chool-soo’s true nature as a werewolf started to emerge. I was extremely impressed with South Korean director/writer Jo Sung-Hee after discovering his debut feature The End of the Animal (2010) at a film festival screening a couple of years ago. It was a catastrophe film shrouded in deep enigma and cryptic happenings. Jo returns here with his second film, the much better budgeted A Werewolf Boy. The title A Werewolf Boy is somewhat misleading as the focus of the film is not as much about lycanthropy as you would expect. There are a couple of scenes where we see Soon Joong-Ki transform into a werewolf and this plays out somewhat through the latter parts of the film. Mostly though, the film resembles works like Francois Truffaut’s The Wild Child (1969) and Werner Herzog’s The Enigma of Kaspar Hauser (1974), stories about feral children and how they are socialised. 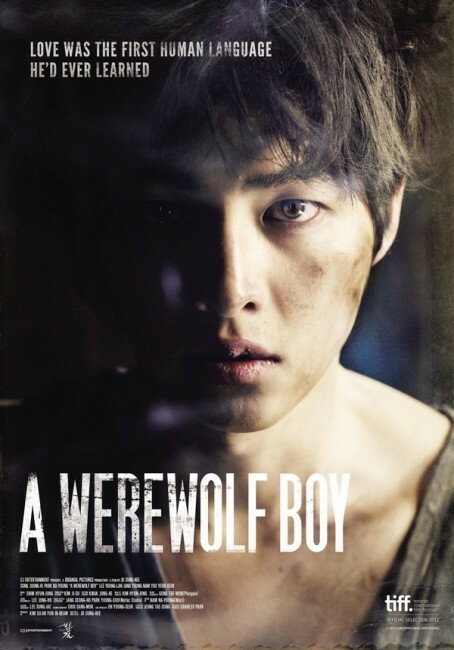 The greater emphasis of A Werewolf Boy is not on Soon Joong-Ki’s transformations and animal nature – indeed, the film offers little-to-no explanation for this or for that matter why he is living a feral life – but on the process of socialisation and the love that grows between him and young Park Bo-Young. Where almost all werewolf films end up in the horror genre, the plot arc of the story here is a fantasy more akin to the way Tim Burton’s Edward Scissorhands (1990) reinterpreted the Frankenstein story – where a family end up adopting a guilelessly innocent and unsocialised boy and the eventual attraction that ensued between he and the teenage daughter. Where The End of the Animal was mysterious and elusive, A Werewolf Boy is completely the opposite. It feels as though Jo Sung-Hee has gone from making an independent film to something far more overtly commercial. This is a film that you feel has been written directly for the all-important Korean teenage demographic and deliberately cast with good-looking stars. You feel can almost feel it trying to be a Korean Twilight film. Everything that happens seems to have been designed to make it an easy sell to this niche – easy clearcut villains, contrived dramatics at the climax. In particular, the emotional connection between Soon Joong-Ki and Park Bo-Young is shot with gauzed-out photography and weepy music on the soundtrack so that every emotive beat is spelt out in larger than life terms. At complete oppose to The End of the Animal, this is not a film that holds a great deal of subtlety or mystery to it. The other confusion also becomes the vagueries surrounding Chool-soo’s origin. Jo Sung-Hee gives us almost nothing about this. The film seems undecided between telling a feral child love story and a werewolf tale with the latter not that easily grafted on – the entire story, for instance, could have worked just as well without any werewolf element. Furthermore, there is an element about illicit experiments and military heavies that come in at the last moment and ends up jarring the delicate balance of the tender love story. It is this need to add villains and a classic chase/separation element to the story at the climax that weakens it. I wanted to like A Werewolf Boy because of my expectations of Jo Sung-Hee but what we end up with a nicely made but simplistic love story that has sold out on enigma and mystery and ends up playing to the violins and heartstrings so much that it eventually becomes manipulative. Jo Sung-Hee next went onto direct the hard-boiled detective thriller The Phantom Detective (2016), which sounds like it should be a genre film but isn’t, as well as write the script for Killer Toon (2013), a horror film about murders that follow a cartoonist’s drawings.